During Christine’s visit, she suggested her husband Drew go paragliding for the first time. 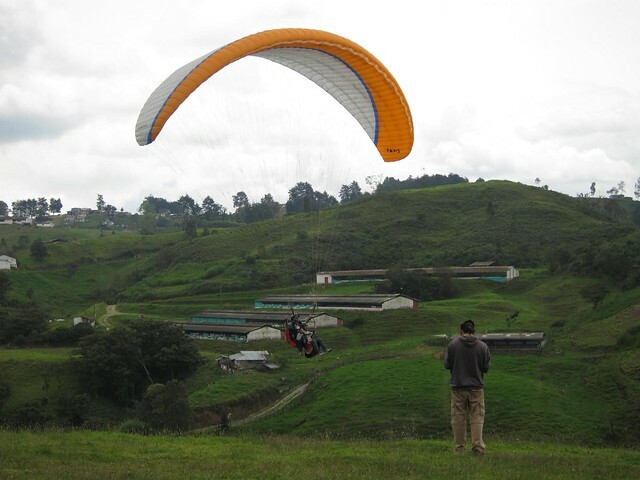 I enjoyed my experience paragliding in Medellín so much so last year that I took the opportunity to go again. 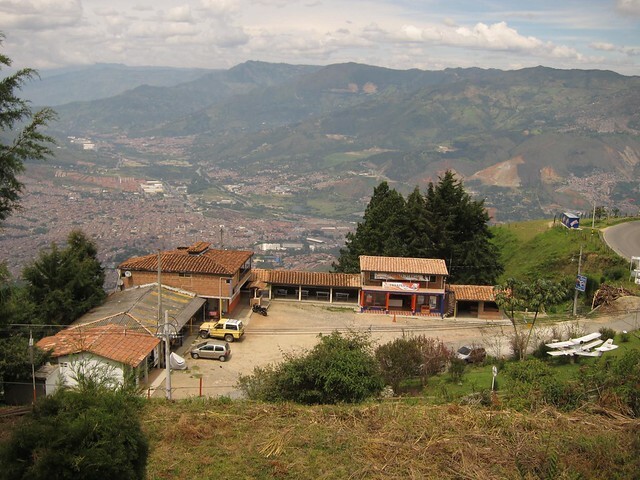 The process for getting from the metro line in Medellín to the paragliding offices hasn’t changed, therefore I was able to help guide our crew, including Troy and his French friend living in Bogotá, to the northern bus terminal (Caribe metro stop), and subsequently onto a bus headed for San Felix. Drew and the instructor start walking for their takeoff. When we reached the paragliding offices about 45 minutes later, we called Dragonfly Paragliding (or Parapente in Spanish). Ideally we would’ve called a day or two early to make a reservation, but given how the weather can vary from day-to-day, I figured it’d be no big deal if we got to the staging area first and then called him up. Alejandro and his brother run Dragonfly, and Troy was referred to them by a friend. Troy captures Drew’s flight on video. As it was a weekday, it felt like we had the whole hilltop to ourselves. Troy and I went with the brothers first, and unlike my sketchy take off last year, I barely needed to take a few steps this time before I could my feet leave the ground. At that point, I only needed to sit back in the seat and enjoy the ride. A paraglider comes in for a landing. The thermal energy tends to be stronger in the morning when it’s more likely that the sun is out, so it pays to arrive early, and if you go with a group, try to be one of the first people to fly. The reason being that the weather can change quickly in the mountains and once clouds start rolling in you might not be able to reach as high an altitude. Colorful canopies fill the air. My flight with Dragonfly was far better than the one I had last year due to the conditions, and the pilot made me feel completely comfortable. I forgot how many flights he had under his belt, but it was something like 5,000 over 10+ years of paragliding in Colombia. He didn’t speak much English, but it wasn’t necessary. The small collection of paragliding shops perched below the takeoff and landing area. When it was Drew’s turn to go, it was already around noon. He’s a bit heavier than Troy, myself or the French guy, which wouldn’t normally be an issue if winds were higher I believe. The first half hour of his flight was great, he reported; however we’d noticed he was drifting down in altitude, slowly, and into the valley. Instead of being able to catch some thermals to gain altitude and fly back, they continued to descend. We started to wonder if he was going to make it back. Eventually, after another thirty minutes, the pilot realized it wasn’t going to happen, so he set them down in a cow pasture. Christine, Troy, the French guy and I all went down to the paragliding shops to wait for him. It turned out to take several hours for them to take a taxi to the bus station, and then get a return ride back up the mountain. Drew looked exasperated when he finally did arrive though we were all happy he was safe. Contact Latin Hosts to book your paragliding experience. They can provide a bi-lingual driver so you arrive safely and to help if any translation is needed before you jump. If transport is not needed, you can also reserve the flight and benefit from Latin Hosts special pricing and customer service. Ooh, I just got to try paragliding for the first time a few weeks ago and I’m completely hooked, the feeling of freedom is amazing. I love your photos! Thanks Catia. I’ve been tandem skydiving, and done a large canyon swing in New Zealand, but paragliding feels the closest to flying for me. And for some reason, less dangerous than handgliding, which I have yet to try. 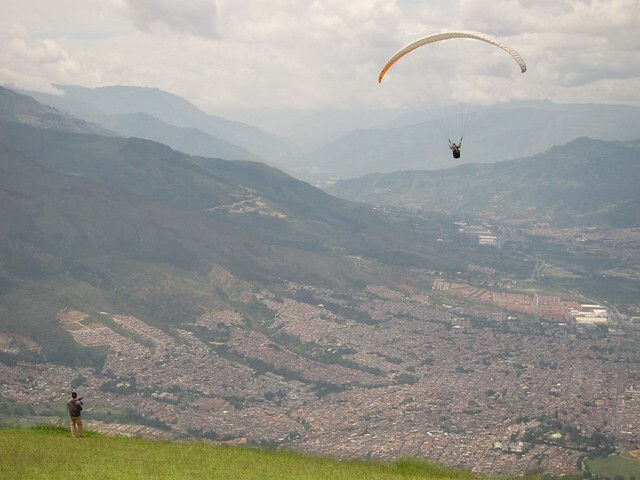 That looks totally awesome, paragliding in Medellin! 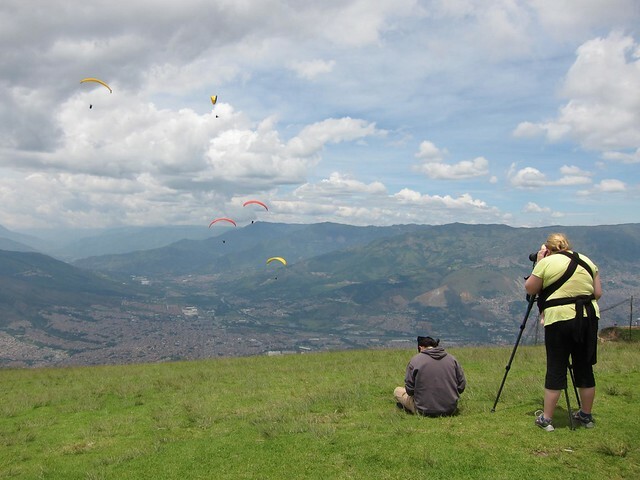 I am going to add that to my to do list for when I get down to Colombia… Question: While you sit in the paragliding seat, are your hands free so you can you pull out a camera, or flip cam, and take video from the air? Yes, you can definitely snap photos or video while you’re flying — a benefit of doing a tandem flight! The sound quality on video can be terrible though, as the wind can be really loud. Looks like soooo much fun! It’s on my Bucket List!!! 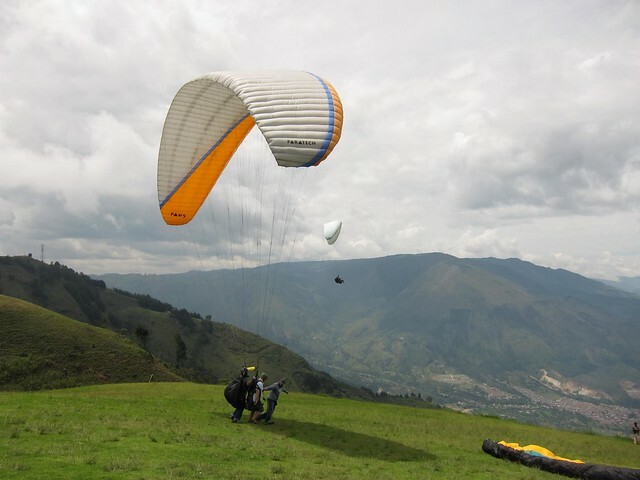 excellent report, I was not aware that Medellin was such a nice paragliding location. awesome valley view pictures. have to go there sometime – been mainly flying in the Swiss Alps myself so far. You guys have to take this trip! The people are great, Alejandro and his entire crew really make you feel like friends and very comfortable. Laughing and joking the whole time and plenty of experience under their belt!! A guaranteed great time and for 80,000 pesos, you can’t go wrong!!!! Don’t forget to tip these guys, they are well worth it and earn every penny and if you were to go anywhere else in this city to do this, it is 3 times the price so, don’t be greedy!!! They truly appreciate it and you will see for yourself what a great time it is!! One word to describe it is “CHEVERE”!!!!! Unless it’s a package tour including private transportation, I think “3 times the price” is an exaggeration. In my experience, the rates for actual flights are all very similar. It’s only adding a middle man in the form of a tour company that will increase the costs that much. Well, I was only able to find 2 other places via online and the cheapest was $122.95 (US) and yes they both included tours but, I was unable to find others and the point is that for 80,000 pesos, you can’t go wrong! The crew definitely added to the experience as well.